Call of Duty WWII, the new entry in the series in development by Sledgehammer Games, is getting quite close to release, and additional details on the game are coming in quite often. A few hours ago, something new has also come in on the game’s Zombies Mode. 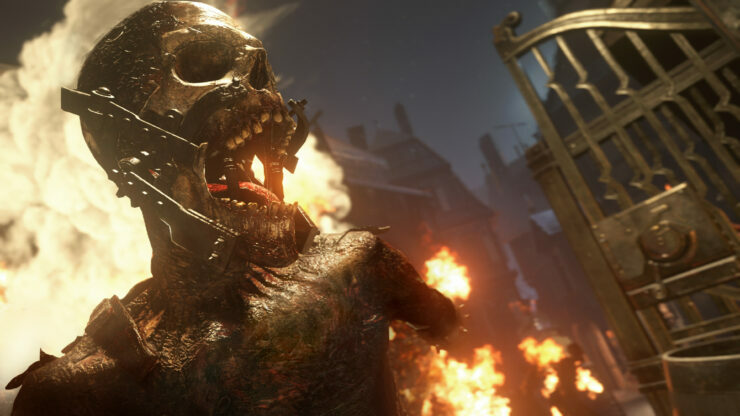 On the Official PlayStation Blog, Call of Duty WWII Zombies lead Jon Horsley talked extensively about the setting and their goal with the mode, which is to create the most terrifying Call of Duty zombie experience ever. PlayStation.Blog: Call of Duty Zombies has always been about four-player cooperative, wave-based combat. Just to set expectations, can we expect the same basic premise behind Call of Duty: WWII Nazi Zombies? Jon Horsley: Yes, the mode is focused on exciting four-player cooperative combat against waves of increasingly deadly zombies. Call of Duty WWII’s Zombies mode is grounded in a gritty, horrifying setting based on World War II, and we take things to terrifying new levels. Horsely also talked about multiple zombie types that will force players to communicate with one another to survive. PSB: The trailer hints at different types of zombies. How far is Sledgehammer going in this direction? JH:In our story, the Third Reich has built an army of the dead in a last-ditch attempt to save the war effort. Interestingly, these zombies retain some of the discipline and purpose of the soldiers they once were. Each zombie type fills a specialized role as well: there are flaming zombies and running zombies, for example, and they will give you serious problems if you get cornered. It will take a ton of strategy and teamwork to survive the varied undead soldiers in this mode. Teamwork, communication, and a level head will be key! Call of Duty WWII launches On November 3rd on PC, PlayStation 4 and Xbox One. A PC beta will be held soon.